Mukimo is one of the staple dishes of the Kikuyu community in Kenya. 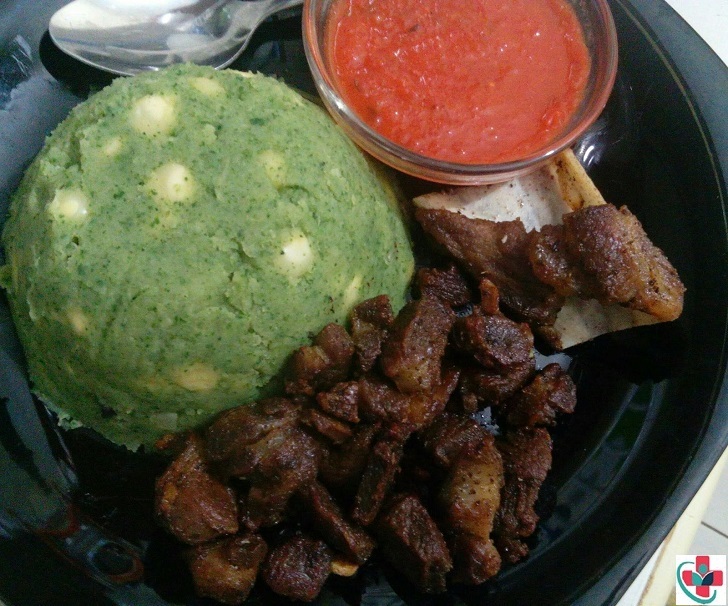 It consists of green maize, potatoes, green peas and kahurura (pumpkin leaves) all mashed together. There are many variations of mukimo recipe. Some people use spinach as a substitute for the pumpkin leaves or beans to substitute for the green peas. In some communities, pumpkin is used as a substitute for potatoes. Here, I share with you a recipe for making. It’s easy to make and you will have all of your friends and family asking for this recipe. Boil potatoes in salty water until tender. On a separate pot boil maize and wash your spinach. When potatoes are done, before adding spinach make sure potatoes are almost dry to avoid watery potatoes. Blend the spinach and add to the boiled potatoes, don't mash cover for 10 min. When ready add the cooked maize and mix thoroughly, mash well and fry onions until tender add to the mixture and mix well.....simple! Reduce to low heat and give it a good stir for 10 min, add the onions and garnish with some coriander, serve hot! Add some water if the sauce is too thick, when ready to your liking, serve hot!